So with photon probably being released in a few weeks we will have a AUv3 midi recorder/looper which will enhance AUM as a performance tool. What I love to see is AUM have a built-in audio recorder/looper which could be added to any track via a node. Second to that possibly an AUv3 audio /looper. What are the chances of this actually happening in the next months? 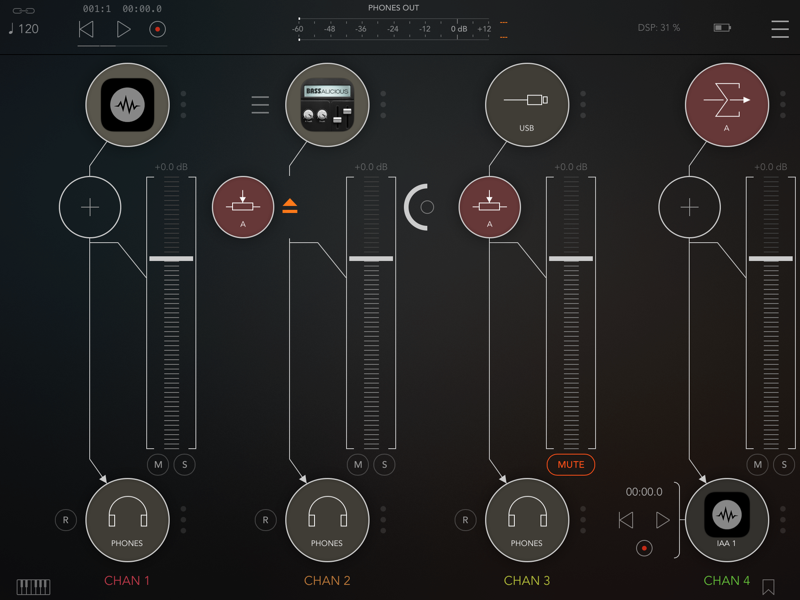 While it isn't an AU solution, Loopy, AUM and AudioBus 3 synergize incredibly well. See the recent thread about setting it up. Loopy is such a well-thought out, mature and well-executed app. I only recently discovered the joys of using it with AUM to create live looping jams with up to 12 loops being created and used in realtime. Like magic. However I would like to just use AUM in an ideal world. QuantiLoop and Group the Loop work well in AUM. They’re IAA, not AUv3 though. Can you loop separate AUM channels via this method? Yes, but there is some small amount of work involved. One way is to set the looper on a send channel, then switch out which apps are sending to that channel. You then record your loops into the app play them back from there. 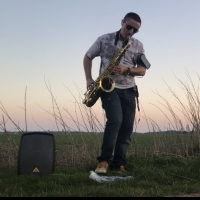 In the screenshot below, BASSalicious is ready to send to Quantiloop but the bus send is disabled and the sound is allowed to go to headphones. The USB (Audio interface) channel is routed to Group the Loop (GTL), so it is the next up to be recorded into it. Sorry, it’s kind of difficult to explain in the time I have right now, but hopefully gives the general idea. Basically, you play through AUM until you’re ready to loop something, when ready you engage the send to the track that outputs to GTL, record in GTL, then start the playback from GTL. Same basic idea for QuantiLoop, I think. With Loopy, AUM, AB3, You basically can do everything without leaving AUM, including changing loop lengths. Automatically advances to the next available loop. Automatically plays back the loops as you record. And up to 12 loops. GTL is an excellent app, but for this use-case I think Loopy really shines. When you say without leaving AUM, I assume you're using a midi controller to control Loopy right? Like loop length/multiple, etc. etc.? 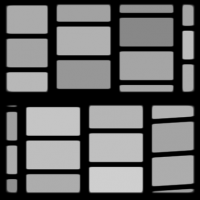 Icons for Loopy show up on the AB3 palette to change loop length and start/stop recording. And you can do those things with MIDI. But I am happy using the palette. I used to be one of those subhumans. The only reason was though, that at the time aum wasn’t recalling my AB presets correctly with IAA zombies would follow me everywhere. The other reason was to keep the CPU footprint low by using less apps possible. Now, a good few months later and after a few AB updates, everything is running way smoother. Especially with AUM monitoring trick suggested by Janosax. I’m content. Not everyone want modularity and interconnectivity... some of us have a happy living in our island. New to iOS music but this idea is one I’ve long fantasized about: the ability to have basically an array of independently operating Boss Loopstations (loops recorded on the fly, synced to a beat but otherwise free to be any length, that can be added or substracted to the mix in any order). Is this something you’re able to accomplish? Any chance you could demo? @supadom what @Janosax monitoring ?